As you saw in my Room Tour post, I recently completely redecorated my room and bought all new furniture including a new dressing table. 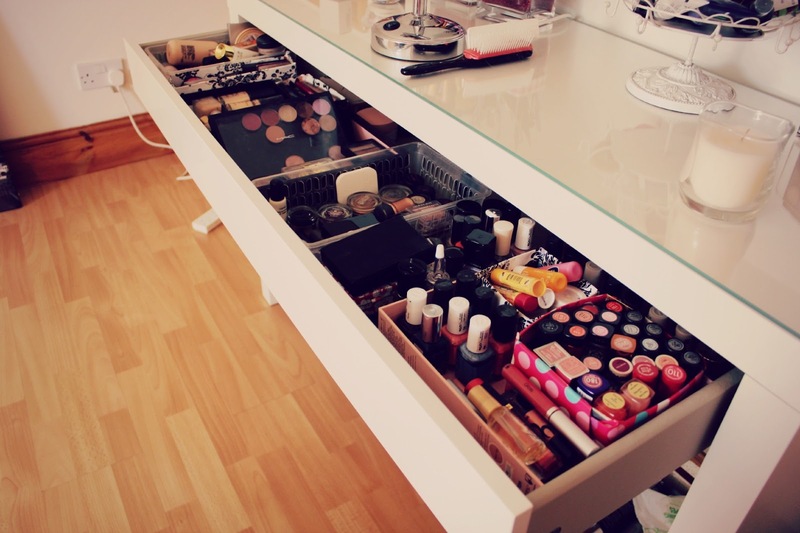 My old one was okay but had four drawers that were quite small and it made it difficult to store my makeup as I could never find boxes that would fit and it just wasn't very practical. 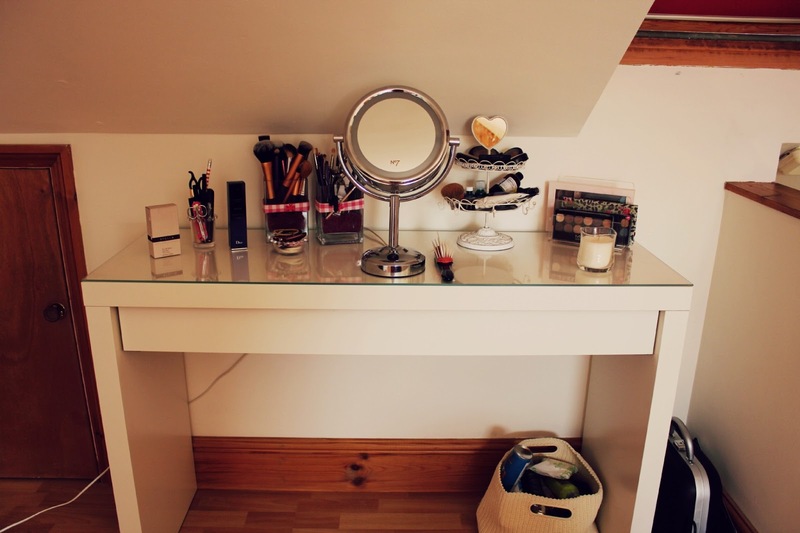 I'd had my eye on this dressing table from IKEA for a while after seeing so many people on youtube and on blogs who had it, I loved the idea of having one long drawer for all my makeup as it just made more sense and was more convenient. It was also so much cheaper than my previous one, I really don't think you can go wrong with IKEA, plus I have so much fun trying to find the aisle and location of each item, sad, I know! It is positioned right by my window which means there is plenty of natural light while I get ready! On the top of my dressing table I have my light up mirror from No7 at Boots which I absolutely love! 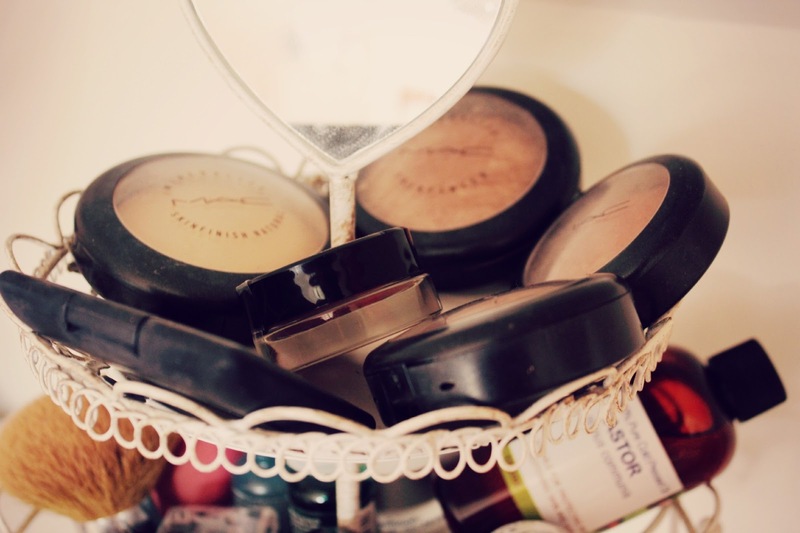 The glass jars that store my makeup brushes are from IKEA and are just decorated with some fabric, the small glass pots which store my hairbands and scissors/pencils/mascara are from a small shop near me but I'm sure you can easily find something similar in IKEA or Amazon. I was given the cake stand looking jewellery holder as a gift but I use it for some of the makeup I reach for daily and on the bottom layer I keep skincare items such as spot treatments, my castor oil and moisturizer. I keep my Stella by Stella McCartney perfume on top of the table and also have my Diorskin BB cream as I am testing it out at the moment. 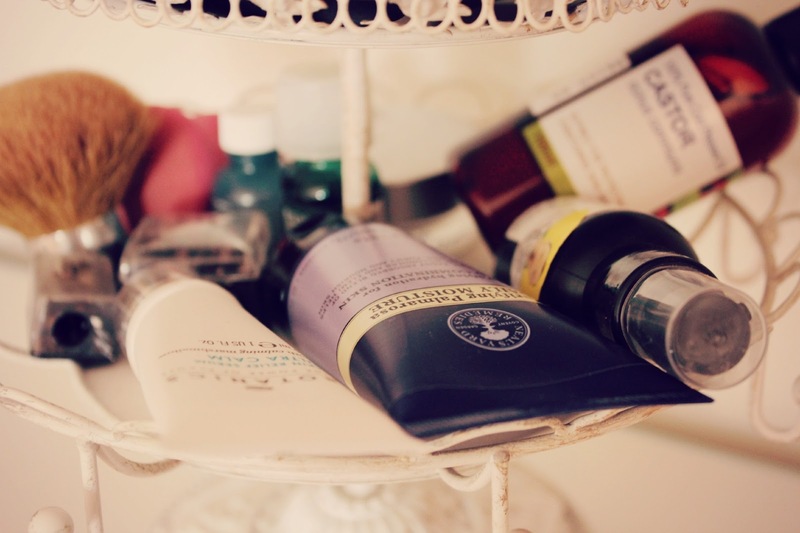 I use a letter holder for some of my palettes which is from WHSmith and then have a Glade candle. 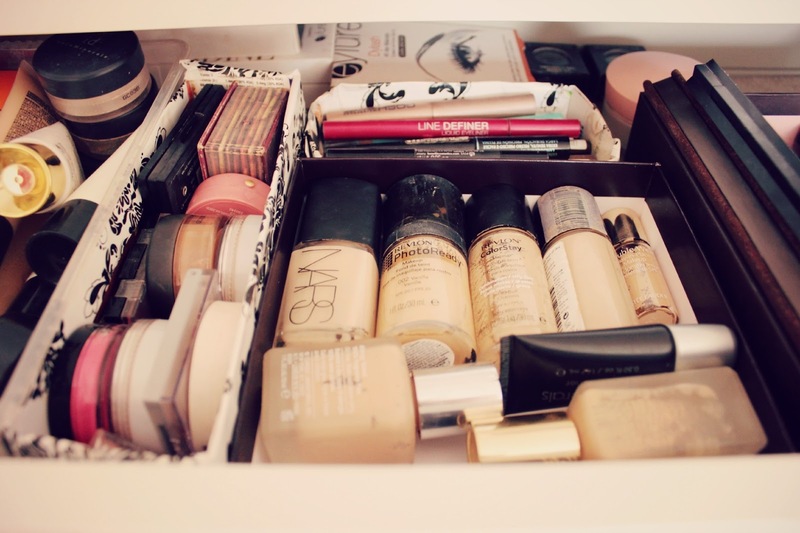 On the far left of my collection I have my skin products, as you can see I have a foundation problem, I have so many it's ridiculous but I do switch between them quite a lot! The plastic box that I store these in is from Tesco and I got a pack of about five that came together! Next I have some blushers/bronzers which are stored in a little thing that I actually made from cereal packets and covered in wrapping paper ages ago! I really need to replace this but it works quite well for blushers and bronzers! 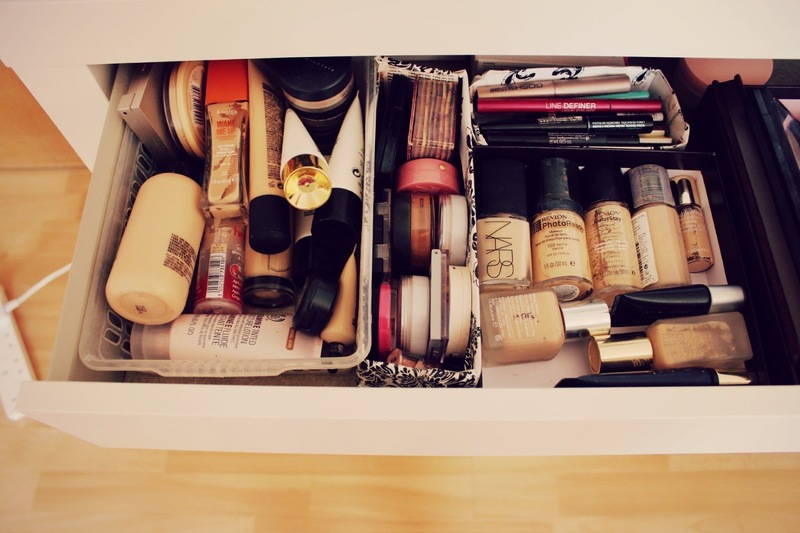 I made the same kind of thing for my eyeliners too, I have more foundations stored in part of a box, I think this was the box that my Bare Minerals foundation kit came in! 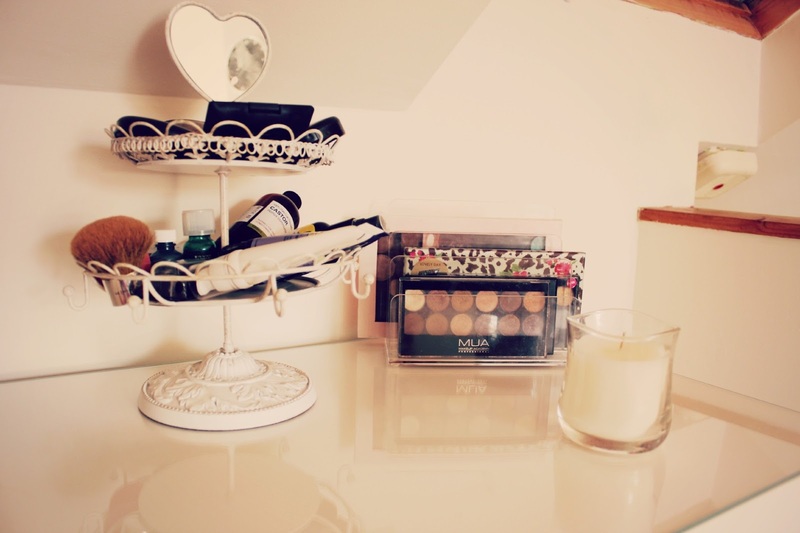 I then have a few more palettes that don't fit in the letter holder on the top of my dressing table, including my much loved Urban Decay Naked Palette and my MAC palette. In the next box I have some eye products, I really don't have many eye products as I mainly use eyeshadow palettes so only have a few cream shadows and single eye shadows. I really struggled with my nail polishes and I didn't really have anywhere to put them so they are scattered around wherever I have free space! 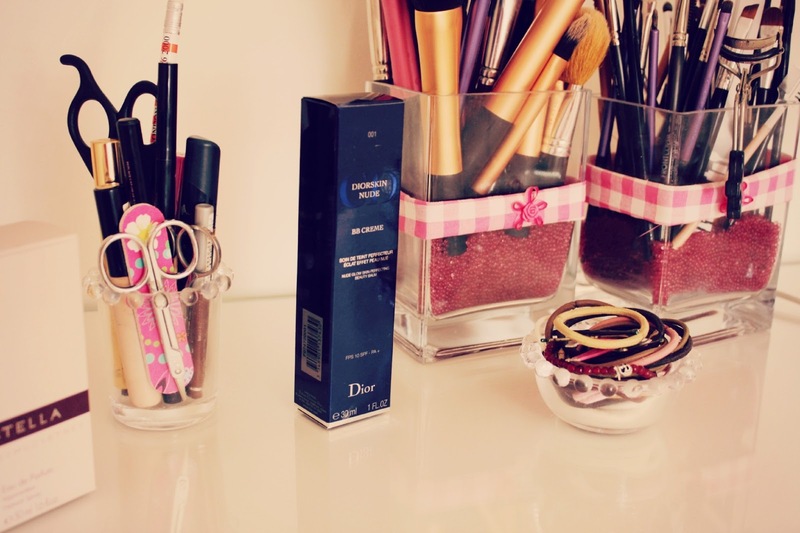 In another box I have my lip products, separated into lipglosses, lipsticks and lip balms. Again I have some storage I made with cereal boxes which I really need to change as it was meant to only be temporary and they are starting to look a bit shabby! A trip to Muji is needed I think! 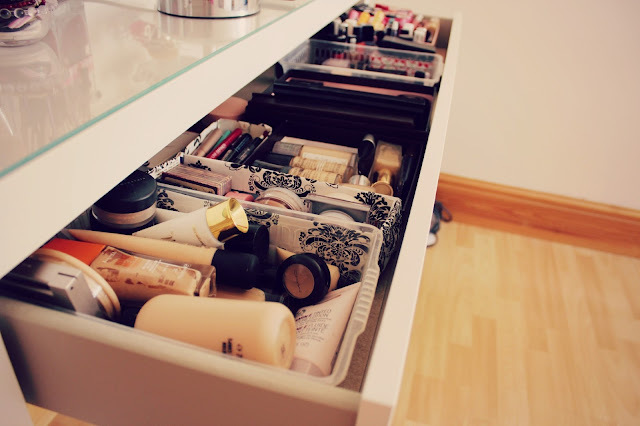 I also think I need to buy a few drawers for on top of my dressing table to keep some of the products I use on a daily basis just so they are easier to reach for if I'm in a rush! You can't see too well but I keep my false lashes and brow tint kit at the back of the drawer as I don't use those too often! 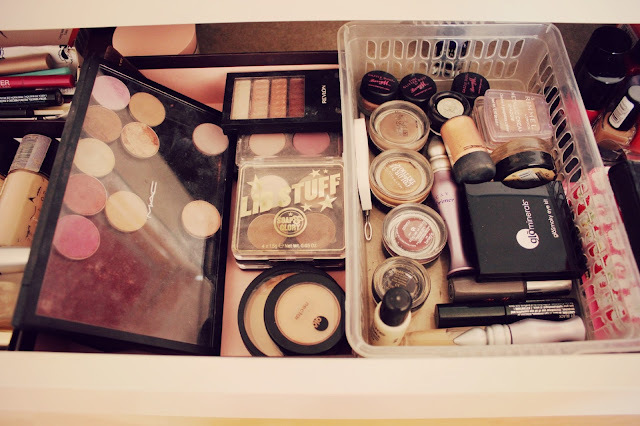 So that's my makeup collection! 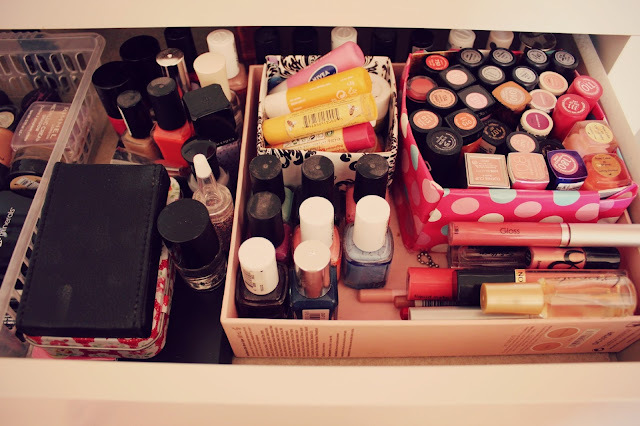 I do have another draw in my six drawer unit that keeps body products like fake tan, moisturizer and hair products! 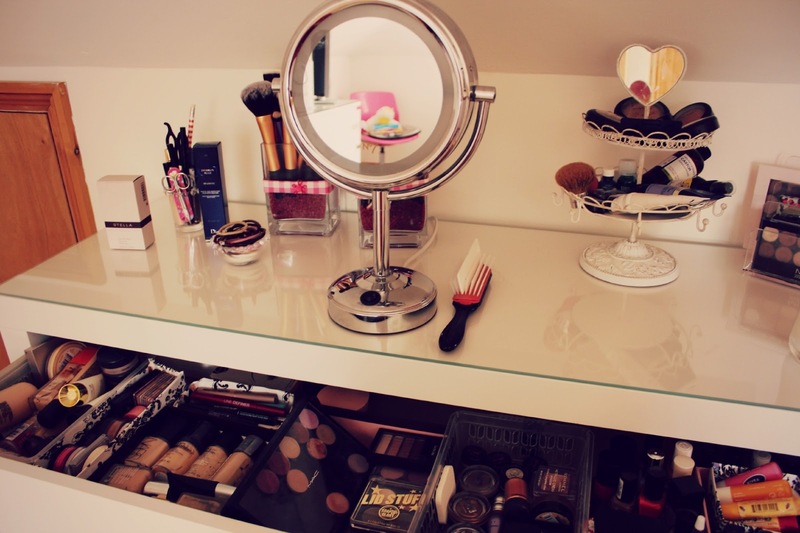 I LOVE your dressing table. Everything's laid out so nicely. My favourite part definitely has to be the mirror. I absolutely loved this post. 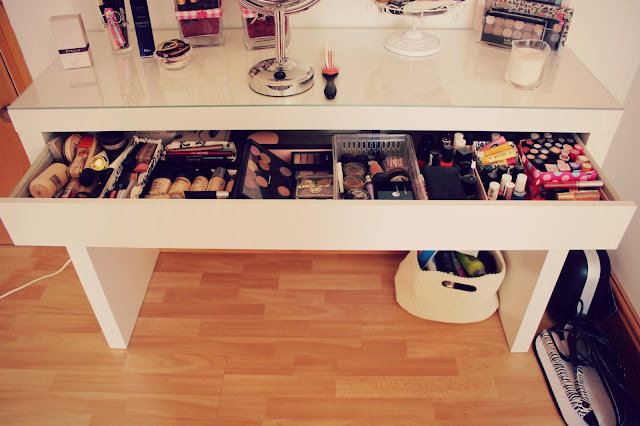 You have an amazing makeup collection! Do you prefer your urban decay palette or your mac palette? - I just cannot decide whether to stick to mac or buy the UD original naked palette. 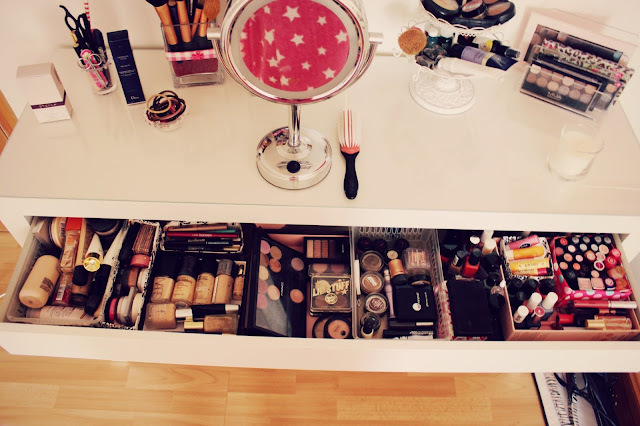 I love your vanity! So much STORAGE!! !